MIRAJ: The Hon. Ganpatrao, Chief of Miraj (fl.1870s). bl.uk > Online Gallery Home	> Online exhibitions	> Asia, Pacific and Africa Collections	> MIRAJ: The Hon. Ganpatrao, Chief of Miraj (fl.1870s). 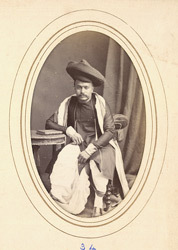 Full-length seated carte-de-visite portrait of Ganpatrao, Chief of Miraj (fl.1870s) from the 'Album of cartes de visite portraits of Indian rulers and notables' by Bourne and Shepherd, early 1870s. Miraj state was granted with the title of sardar to Govind Hari Patwardhan by the Peshwa Madhav Rao in 1764. In 1820 the state was subdivided and evetually there was a senior and junior branch. This is a a portrait of Ganpatrao, Chief of Miraj of the Senior branch.